6월5일 인제 내린천으로 레프팅 캠프를 떠나요! 한국어 설명은 우선 더 보기를 클리하셔서 영어,일본어 설명 다음에 있습니다. Total 38ppl has wired money. But more than 60ppl told me they really want to go! But only 20ppl are available. Hurry up! First transfer money first get! And if those who are not able to wire money,Pls let me know! Join DealKo for some summer fun outside of the city! We have tons of activities planned from rafting, bungee jumping, unlimited beer and tequila, games for prizes, karaoking, dancing, and more!! The entire DealiciousKorea team (Terri, Herbie, Nick, Henry, and Victoria) will be your guide for the 2 days. We will also have a professional photographer join us to take as pictures and videos that will be uploaded on Facebook. 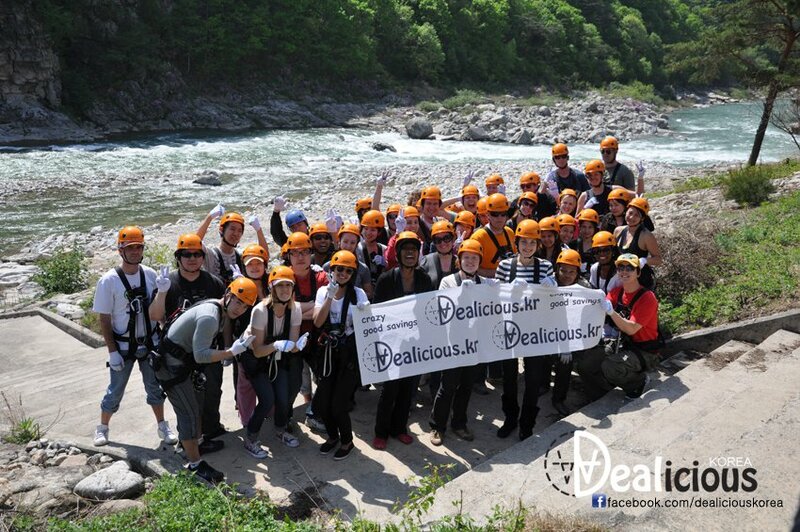 DealiciousKorea's mission is to create a meaningful community among our members and bring you the BEST deal available in Korea. We want our Expat family to get the same discounts that locals get. => Depart from Seoul National University of Education (Gyodae station, Lines 2 (green) and 3 (orange), Exit 4). It is only 1 stop away from Gangnam stn and express bus terminal. Again, it is NOT Seoul National University!!! Be careful! TOTAL: 165,000원으로부터 33.3%할인해 100,000원으로 참가할 수 있습니다. 주의 사항: 1 인당 5매이상 한정 구입 가능합니다. 1. http://www.facebook.com/editaccount.php? language#! /event.php? eid=173422962715226&notif_t=event_invite」에 접속해 참가를 누른다. 또는 「dealicious2011@gmail.com」까지 「이름, 휴대 번호, 살고 있는 지역 「예를 들면"혼데 OR강남 등"」참가 의사의 메일을 보낸다. 17:00번지 점프(별도요금) 가지 않는 사람은 쉬어 타임! !